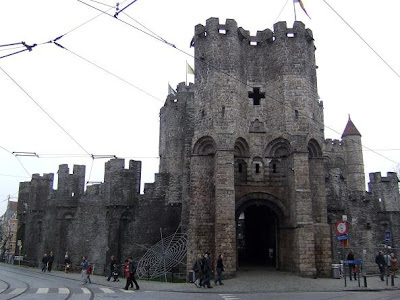 The Gravensteen (Castle of the counts) in Ghent was build in 1180 by Philip of Alsace, who was count of Flanders. 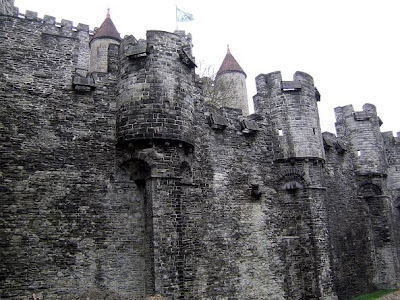 He was inspired by the castles that he saw while he was participating in the Second Crusad. 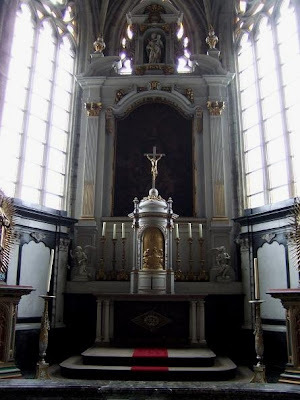 The cross on the front wall is still a reminder of Philip of Alsace’s devotion. 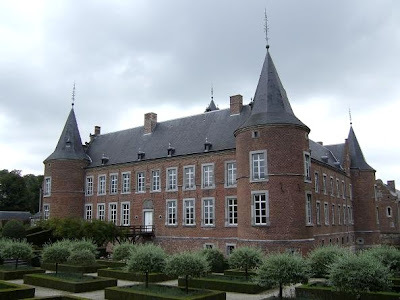 In the 14th century the castle was abandoned by the counts of Flanders. 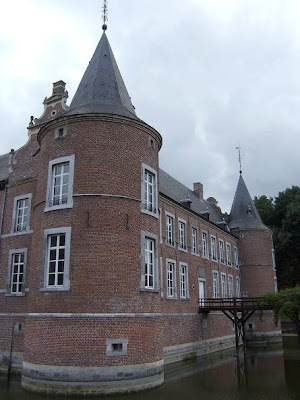 After it was used as a courthouse and a prison the castle decayed. 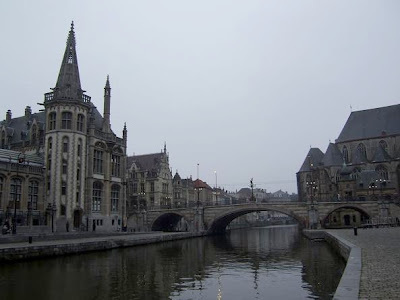 In 1885 the city of Ghent purchased the castle and renovated it completely. 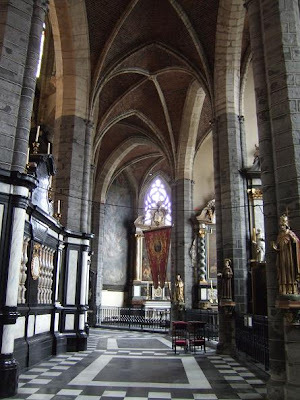 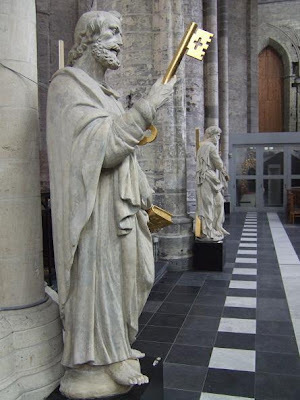 The St. Bavo Cathedral(St. Baafs Cathedral) can be dated back to 942. 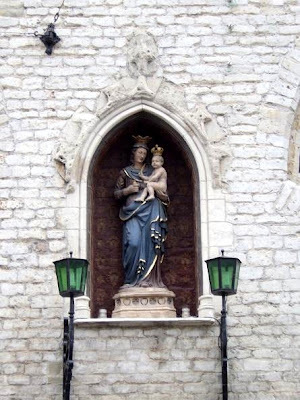 Traces from a Romanesque church that stood here can still be seen in the crypt today. 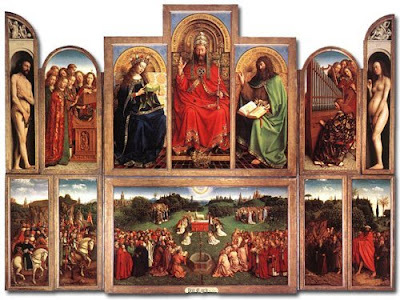 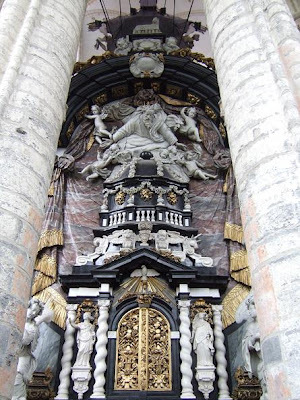 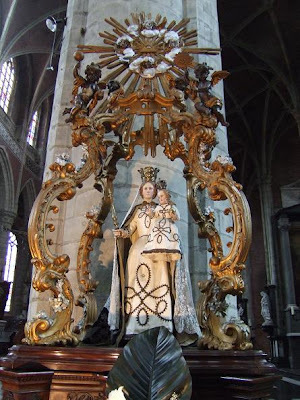 Between the 14th and the 16th century the cathedral was permanetly rebuilt in Gothic style.The cathedral houses many art treasures, the most important is the painting made by hubert and Jan van Eyck called "the Adoration of the Mystic Lamb"(last photo). 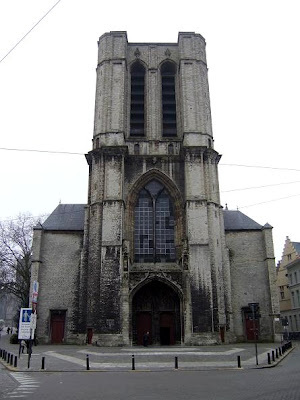 The St. Bave Cathedral in Ghent is situated opposite the Belfry Tower. 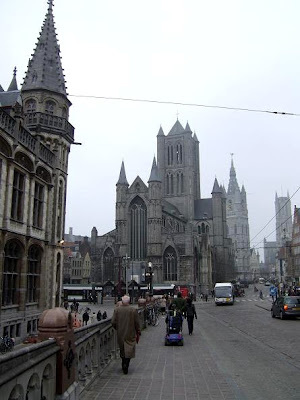 Construction of the St. Michael's church in Ghent started in 1440. 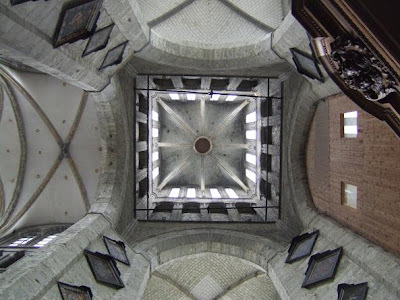 The original plan was to build a 134 high steeple for this church. 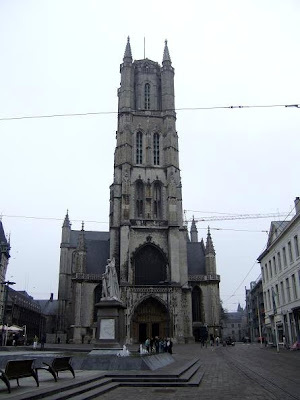 Because of financial problems only a 24 metres high tower remained. 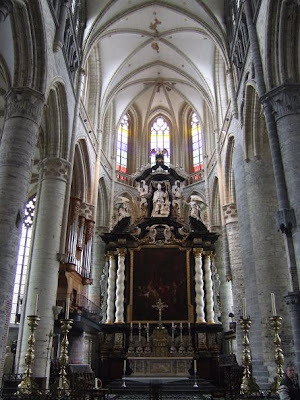 Inside the church you can see numerous painting by famous masters, including "Christ on the Cross" by Anthony Van Dyck. 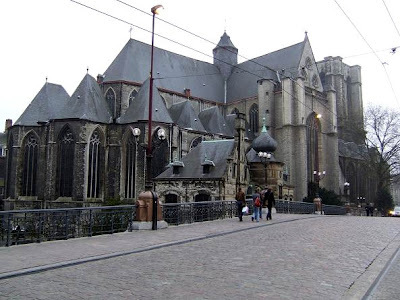 The St. Michael's Church is situated next to the St. Michael's Bridge in the historical center of Ghent. 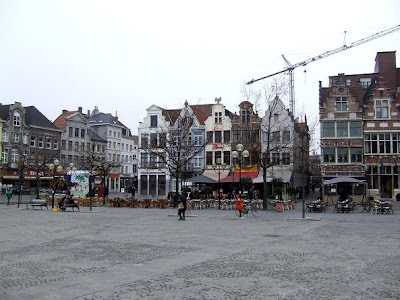 The Vrijdagmarkt(Friday Market) is a square that played an important role in the history of Ghent. 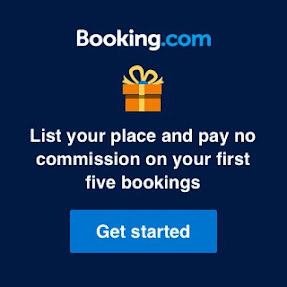 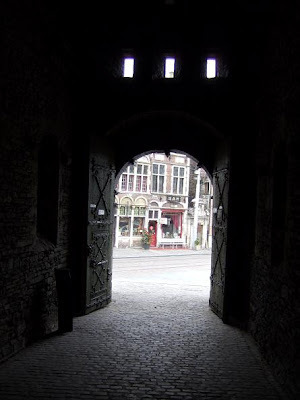 For centuries this was the place where public political and social life took place. 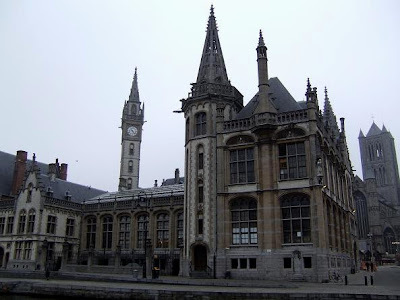 It was here that the flemisch count had to swear their observance of the freedoms accorded to the citizens of Ghent. 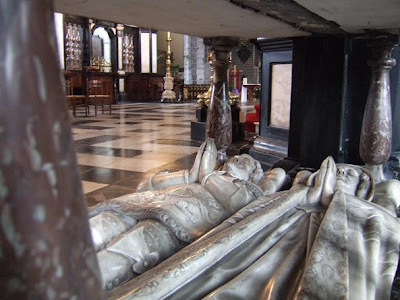 It was also the place where King Edward II of England was proclaimed King of France in 1340 by the guilds. 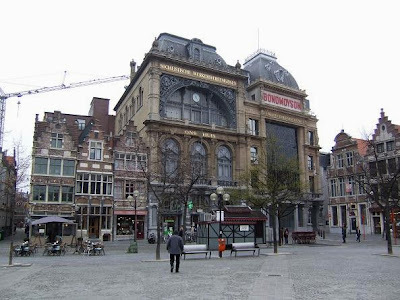 It is called the Friday Market because for centuries on Fridays a market takes places here. 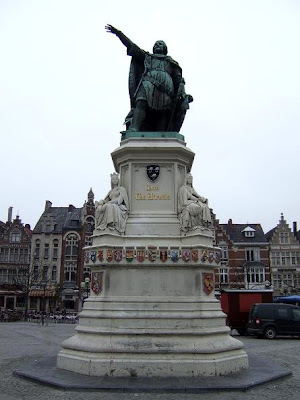 The statue on the 3rd photo is of Jacob van Artevelde, he was a Flemish statesman and political leader. 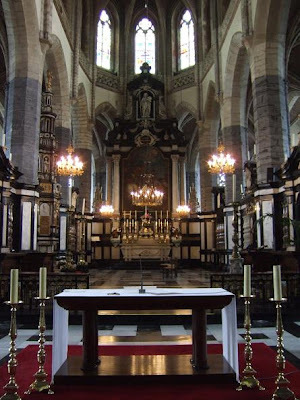 The St. Nicholas Church is located in the heart of the city. 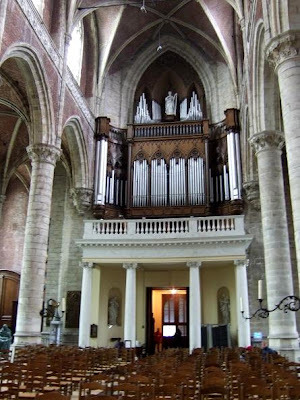 It replaced a Romanesque church that was built on this location. 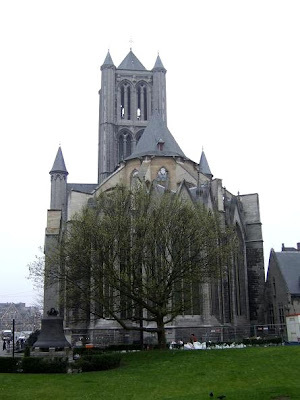 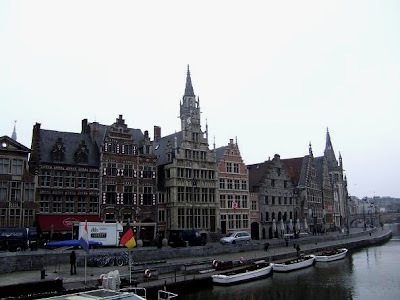 Construction began in the early 13th century in Scheldt Gothic style. 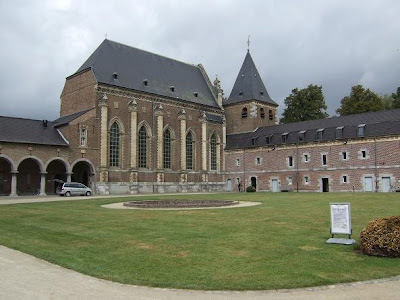 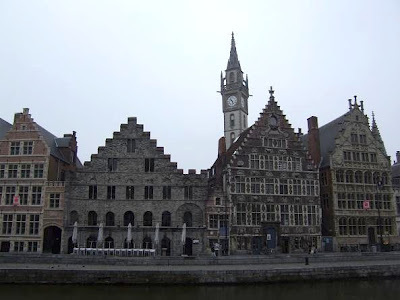 Typical for this style is the blue-grey stone from the Tournai area that was brought up the river Scheldt to Gent and the large tower of the church. 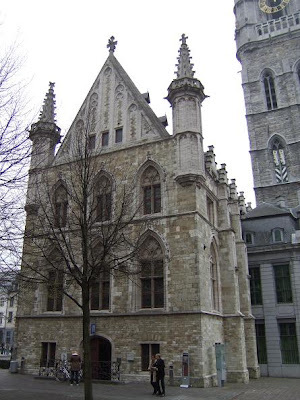 The St. Nicholas church was the church of the rich merchants and guilds who carried out their businesses nearby. 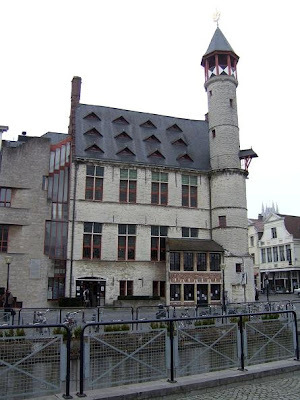 The Meat House in Ghent served as a market where sales were centralised in order to check the meat's freshness and quality. 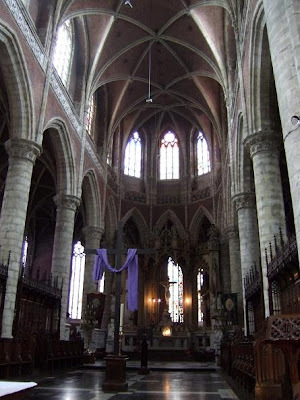 It was build in the 15th century with a beautiful vaulted ceiling. 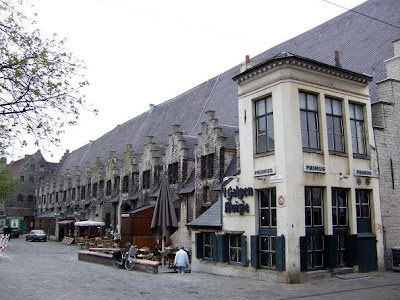 The small white house against the Meat House is called " 't Galgenhuisje ". 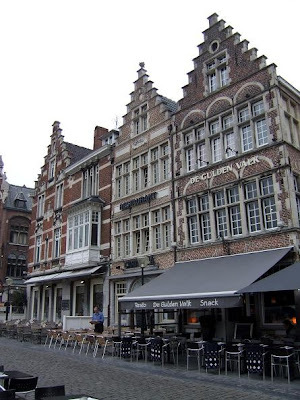 It was used to sell the entrails of the animals to the poor people, now it' s used as a bar. 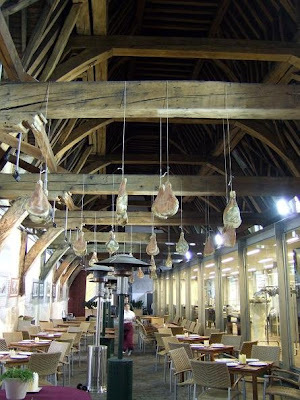 From 2000 the Meat House is used to promote regional products like ham, beer and chocolate. 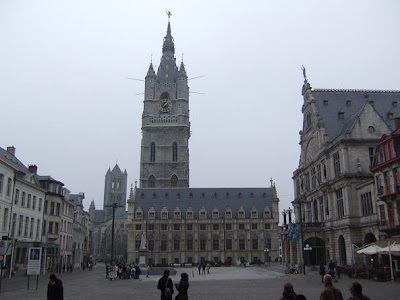 The Belfry tower of Ghent dominates with the towers of the St-Nicholas church and the St. Bavo Cathedral the center of the city. 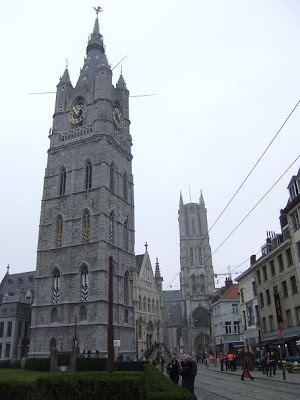 Construction of the 95 metre high belfry started around 1313 and was completed in 1380. 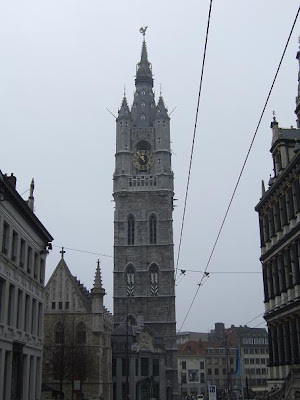 The bell tower was used to announce the time and various warnings. 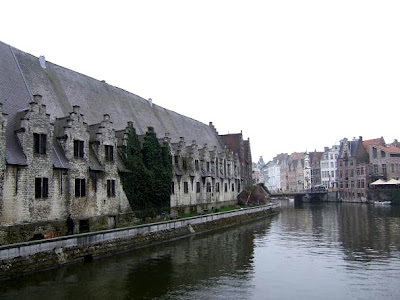 The Cloth Hall against the tower dates from around 1425 and was the gathering place of wool and cloth merchants. 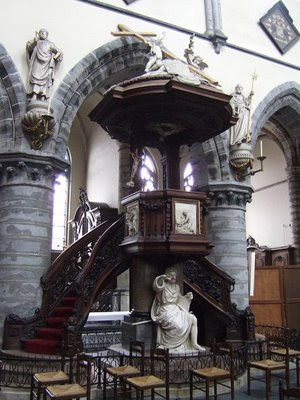 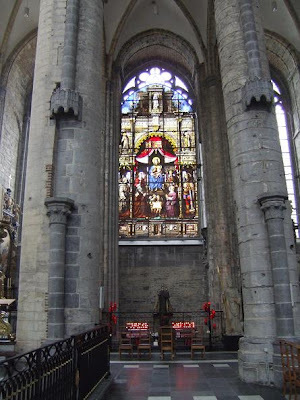 The oldest parts of the St. Jacobs church in Ghent date back to the 12th century. 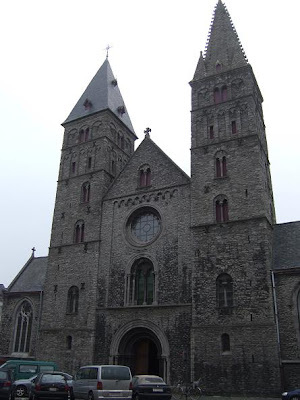 Later the church was converted and made bigger in Gothic style. 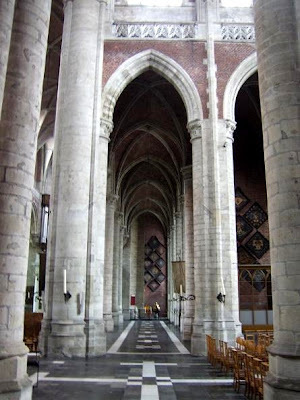 You can see the difference between the 2 styles in the towers. 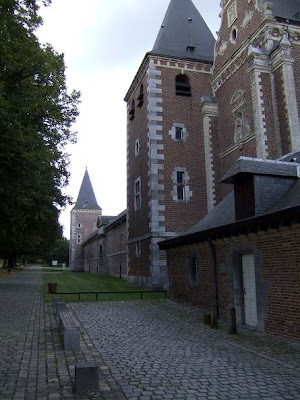 The east tower was built in the 15 century in Gothic style with hooks on the roof, the west tower is a remainder from the Romanesque style. 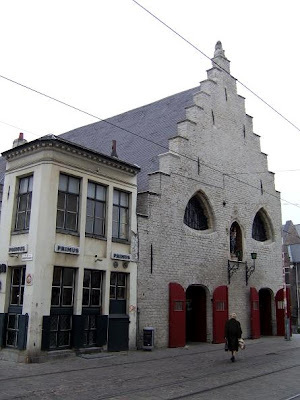 The St. Jacobs church is located in the Lange Nieuwstraat, close to the Vrijdagmarkt(Friday Market). 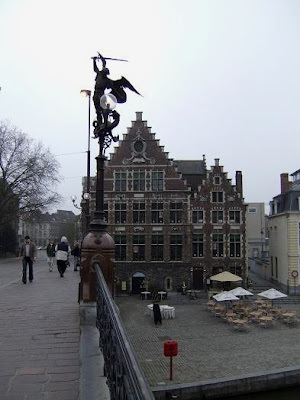 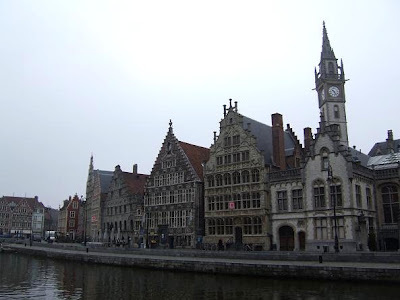 The Graslei and Korenlei are two streets in Ghent which lie along the banks of the river Lieve in the old harbor. 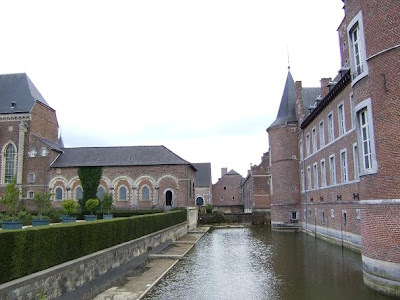 Some of the guild houses here date back to the 13th and 16th century. 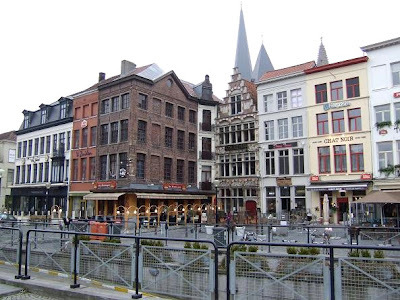 It's one of the most beautiful areas in Ghent and a popular place to have a drink in the summer. 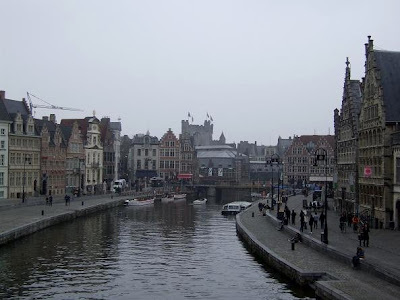 The old harbor is also a departure point for canal trips around the city. 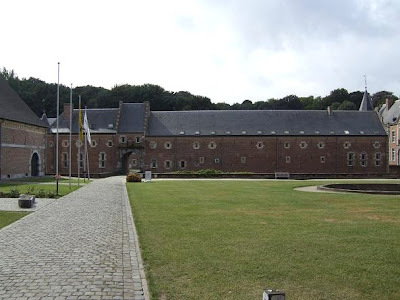 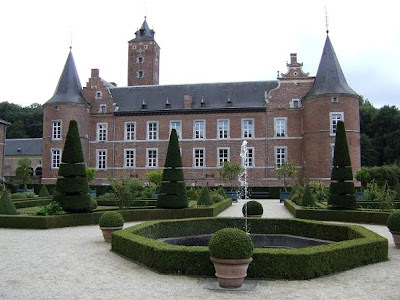 The Landcommandery Alden Biesen was built by the German Order in the 16th century. 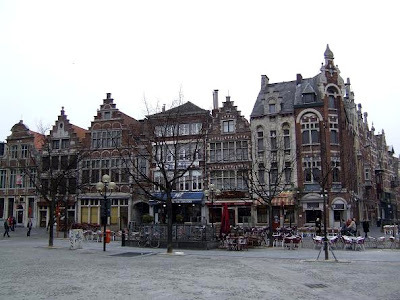 A fire left most of the building in ruins in march 1971. 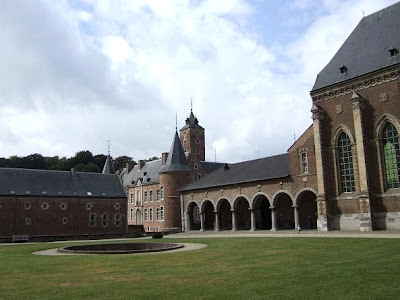 Fortunately it is restored to its former glory and now a beautiful place to visit. 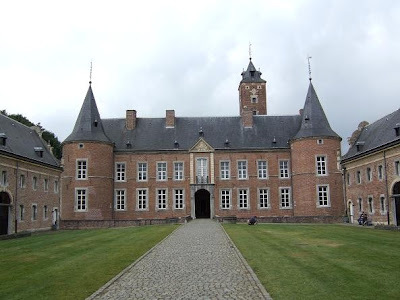 The entry to the estate is free of charge. 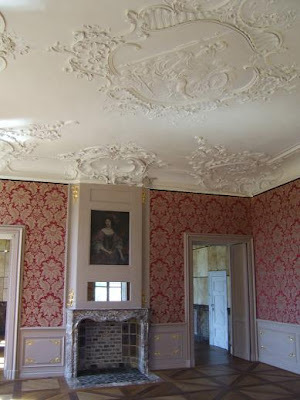 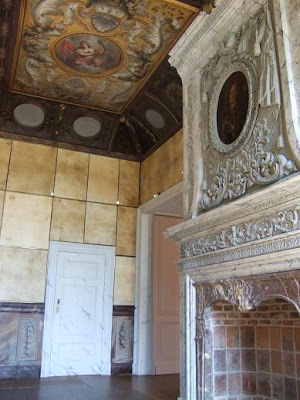 Only if you want to visit the exhibition in the castle and the restored apartments you have to pay a small charge for entry.